Aerospace applications have some of the most demanding requirements when it comes to lubrication. Compared to automotive applications, for example, the temperature ranges where a single lubricant must perform are considerably broader. Military aerospace applications can involve even greater extremes, in addition to other requirements, such as long storage life. Perfluoropolyether lubricants (PFPEs) saw their first commercial aerospace applications under the brand name Krytox in 1965 and have been in continuous production by The Chemours Company ever since. That’s not surprising, given their thermal stability, the fact that they’re chemically inert and their low vapor pressures at very low molecular weights. Elementally, PFPEs consist only of carbon, fluorine and oxygen, with differing amounts of carbon and oxygen yielding different properties. 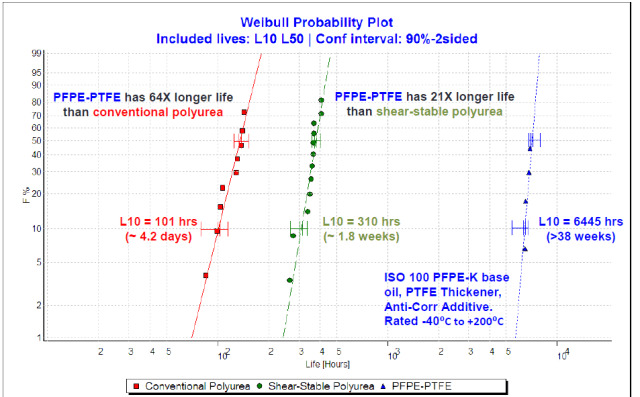 Compared to other lubricants, PFPEs are the least common and most expensive. This is because the supply chain for PFPEs is much more complex and capital-intensive compared to other lubricants. Crude oil, the monomers derived from it and the synthetic lubricants derived from those monomers are produced by the billions of kilograms per year. Krytox, in contrast, is produced using calcium fluoride (Fluorspar) converted to hydrofluoric acid (HF). The HF is then used to make 1-carbon hydro-chlorofluorocarbons which are converted to tetrafluoroethylene (TFE) or hexafluoropropylene (HFP). 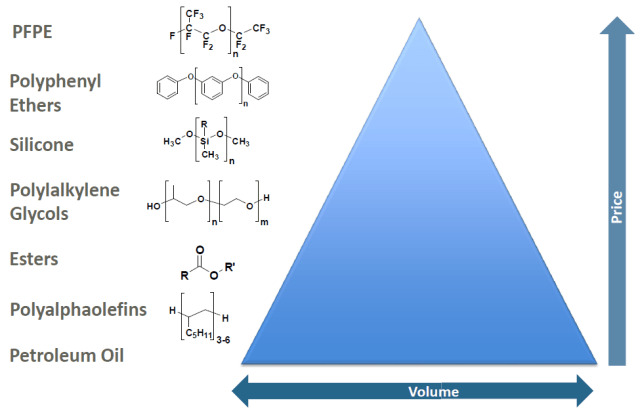 PFPE’s are then produced from these monomers, either directly or via additional monomers. At each step, the volume decreases, so coupling small volume with additional processing causes the price to increase. This limits the applications where PFPEs can compete, such as aerospace. Component failures in aerospace applications can be catastrophic, not only in terms of the capital costs of the parts themselves, but also because of the ancillary costs of repair and safety risks they engender. Volatility is especially important in space applications, since the lubricant must be able to operate in a vacuum. 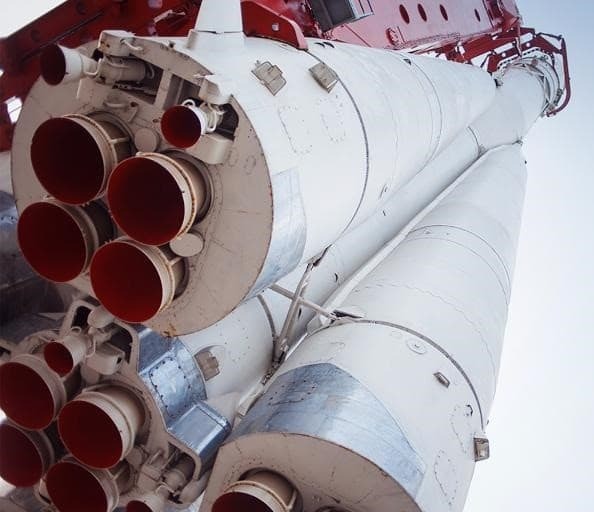 Many space applications require lubricants that can function for the lifetime of the component, since there will never be an opportunity to re-lubricate. There are several key properties of Krytox lubricants that make them well-suited to aerospace applications. They will not burn or support combustion, even in fully liquid or gaseous oxygen. The various grades of Krytox lubricants cover a wide temperature range, from -75°C to +360°C continuous, with spikes to temperatures greater than 400°C. Krytox lubricants don’t degrade or break down in the presence of aggressive chemicals, and offer a long lubricant life with no potential for carbonaceous deposits. Their high lubricant film thickness protects then under high loads and across a range of speeds. They are compatible with most elastomers, polymers and a wide range of metals, in addition to being nonhazardous, nontoxic, non-regulated and completely chemically inert. The recipe for Krytox greases generally consists of three basic ingredients: Krytox PFPE oil, Teflon polytetrafluroroethylene (PTFE) powder and various additives. These additives include anti-wear or anti-corrosion compounds, such as sodium nitrate; compounds for extreme pressure environments, such as molybdenum disulfide; and other additives tailored to specific applications. 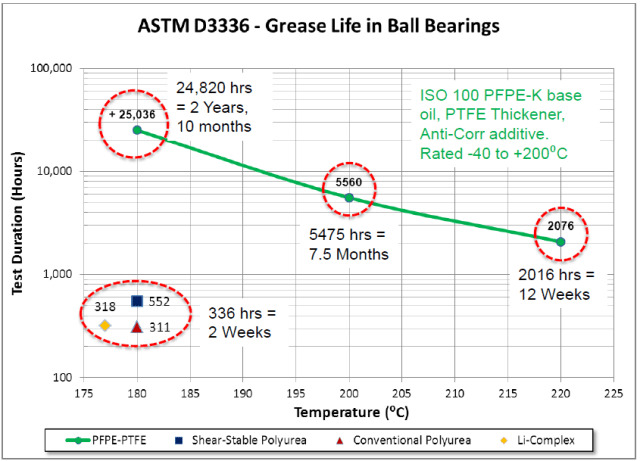 Krytox greases are tested using numerous industry standard procedures for evaluating the life of lubricating greases, including ASTM D-3336 and SKF R0F+ testing methods. The first procedure involves rotating an SAE No. 204 bearing at 10,000 or 20,000 rpm at an elevated test temperature. Using CRC-type spindles, a thrust load of 5-15lbs (22-67N) and a radial load of 15lbs (67N) are applied to the bearing. The test cycle is 20 hours on and 4 hours off for the requisite test temperature. The test result is stated in terms of the number of cumulative hours the bearing will run without exceeding the motor overload set point, torque overload set point, or over temperature limit. The SKF R0F+ bearing grease life testing method involves running five groups of two bearings. Various different bearing types and sizes can be used at speeds between 5,000 and 25,000 rpm and from room temperature up to a maximum of 230°C. The pneumatic loads on these bearings can be set between 50 – 900 N radially and 100 – 1100 N axially. 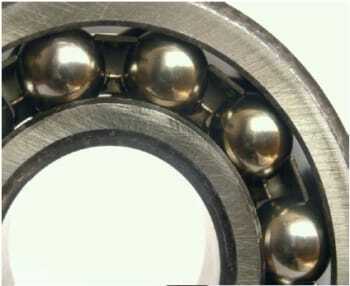 The bearings are run until failure, allowing for Weibull statistical life distribution after just one test. Krytox 283AD grease is used for the engine starter spline shaft in PW 400-series engines and is the only product specified for this application. Krytox 250AD grease is approved for hydraulic and fuel pump splines on PW engines for the A330, A340 and A380 aircraft. Chemours is also currently working with a major OEM on next-generation grease-lubricated fuel pump splines. Krytox AGL683 grease was specifically developed for electro-mechanical actuator bearings, gears and ballscrews. It’s approved for devices in cabin air conditioning and nitrogen generation systems. The light, semi-fluid grease is designed for lifetime lubrication across a temperature range of -70°C to +180°C and is specifically formulated for low-temperature starting torque with an additive package designed for anti-fretting and anti-corrosion. Krytox AGL829 grease was developed as a fire-proof grease for thrust reverser drive units to eliminate the need for external fire blankets. The light gearbox grease is specifically designed to be a sealed-for-life lubricant for low-temperature applications (-60°C) that are subject to high vibration and loads. The Krytox XHT-BD series of greases were developed for extra-high temperature applications and are based on triply fluorinated high-viscosity base oils with a high-adhesion, non-melting thickener. Krytox XHT-BDX is specified for O-rings and flexible couplings in environmental control systems that are used to direct hot engine air for wing and tail de-icing. Components in this application regularly see temperatures of 315°C. 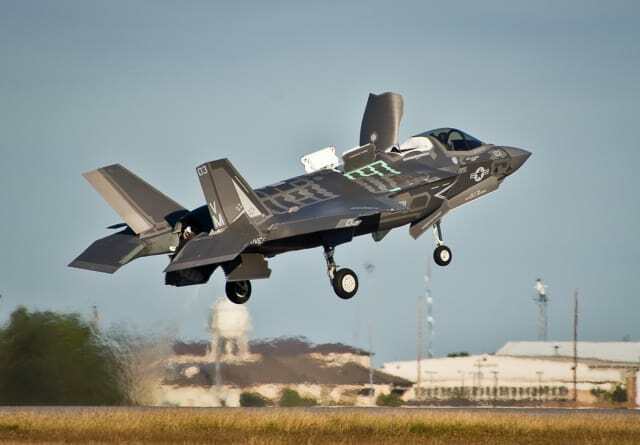 One of the most interesting applications for PFPE lubricants is in the F-35 short take-off and vertical landing (STOVL) variant. In this case, Krytox extreme temperature lubricants are used for exhaust duct bearings, drive gears and actuators, all of which routinely exceed 320°C. 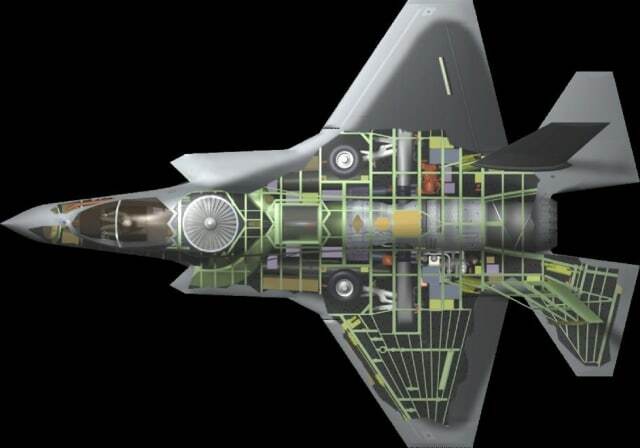 The F-35 also offers an example of using PPFE lubricants to improve performance for traditionally non-lubricated materials, such as the Vespel variable vane brushes found in the F-35 lift fan. Failure in aerospace applications is not an option, especially since operating conditions in aerospace can be severe. Inadequate lubrication or lubricants that do not perform as intended can lead to increased aircraft maintenance downtime and component failures. The combination of thermal stability, chemical inertness and the capacity for low vapor pressures at very low molecular weights makes Krytox lubricants ideal for a range of civil and military applications. From engine mounts, to fuel tank valves, to fighter canopy slide rollers and seat adjuster mechanisms, Krytox is the only way to fly. Chemours has sponsored this post. All opinions are from Ian Wright.